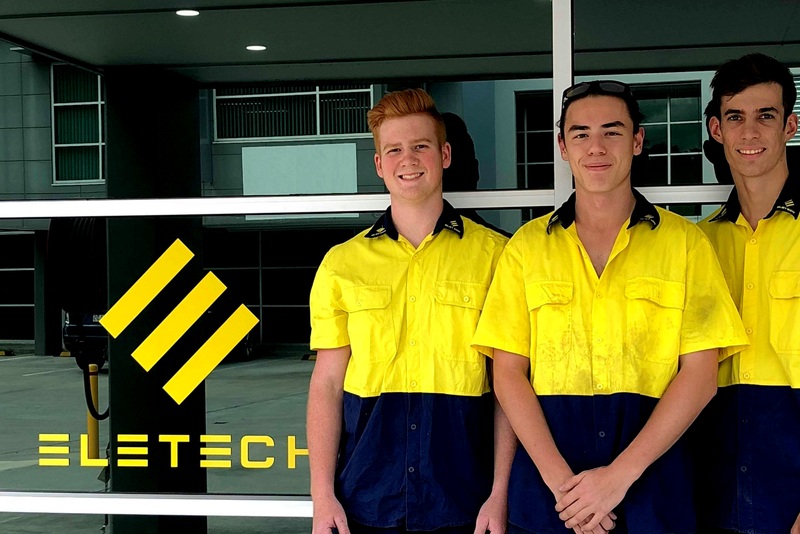 Eletech is excited to announce that we’ve hired three new first year apprentices..
A big welcome to Isaac, Chris and Ricky! Isaac graduated Kedron State High School in 2017. He signed up for an apprenticeship because he liked the sound of doing electrical work. He chose Eletech by chance after seeing an ad for the position available, and he’s glad he did as he’s loving it! Chris graduated St Augustine’s College in 2016. He’s been chasing an apprenticeship in the lift Industry since he finished grade 12. The varied nature of work and mechanical side of it appealed to him. After completing a year at university, Chris found an ad for an Eletech apprenticeship online and applied. Chris said he’s found the work to be more physical than expected, but he is greatly enjoying it so far. Ricky graduated Wavell State High School in 2017. He thought the electrical apprenticeship with Eletech sounded a bit different to a normal electrical apprenticeship, and the opportunity to apply couldn’t be passed up. Ricky has enjoyed learning something new every day and greatly enjoys the challenging nature of the work he’s done so far. We look forward to seeing these young men progress through their apprenticeships as they become an integral part of the Eletech team.